There are two realities I have lived and experienced in the nearly three decades of my life, when it comes to the topic of marriage. Both realities are as intimate with me as they can be, and both are as opposite from each other as possible. And as expected, these realities reflect in my love for movies as well. I was born and brought up in a world where marriage was, and still is, an undeniable truth of adult life. Small towns in our country, almost everywhere in this vast cultural collage that we call India, have a very traditional and typical way of looking at the institution of marriage. One has to marry after reaching a certain age, and mostly, the marriage is arranged by the elders of the families. Those getting married are supposed to accept the decisions of these elders with respect and dignity and, if possible, joy. Love marriages are rare, and if it is an inter-caste or inter-religion marriage it is almost certain that the families will not approve of it. It takes a lot of courage from a parent, who always claimed to have loved his or her child, to agree to that against the norms of the world around them. After marriage, the couple is expected to live through it in good times or bad and make sure the problems between them do not escape their bed-room. I have immense respect for such an institution of marriage. I am amazed to see how successful most arranged marriages are. It intrigues me how two families are bonded forever after one stressful night of unending rituals. It scares me to know how two people are almost forced to be united in body and soul without actually getting to know each other. It pains me to realize how a daughter leaves her home forever, to set-up a new world for herself. This reality is a part of my family, my traditions, their expectations from me, and I can never detach myself from it completely. This reality is the reason why I loved 'Vivah' (2006) despite its uni-dimensional characters and trite situations. I cried and smiled while watching that film, and I completely understand why the biggest success this film had was in the state of Bihar. If you accept the culture and beliefs of the people of that part of India, you will understand too. However, I know that I do not want to be a part of that reality. And the answer to that is in the other reality that I discovered later. I left home when I was eleven. And have grown up to be an individual more concerned about himself than his family. I am more-or-less self-reliant in every way. However I long for someone to take care of me when I am not well, and bear my tantrums, and serve me good food every day. For the past eighteen years of my life, I have been away from all these privileges. All others from my world have got all this whenever they wanted. Add to this the kind of environment I was brought up in - eight years in an ashrama during my adolescence, and five years in an army institue during my early adulthood. My emotional side was almost forced to get suppressed by the intellectual disciplining of mind. I became more and more detached from my first reality. That my first love-affair ended badly did not help either. And around the same time, I discovered the expression of my self-centered, intellectual, alienated self in the cinema of Europe. Kieslowski became my favorite director and psychological dramas became my favorite genre. This new reality was a world of greys, complicated and difficult, less romantic than the world of Rajshri but very real. All my relationships after my first have been complicated. My sense of morality is pretty radical from that of the world around me, and I believe a man's biggest duty is towards himself. I also find myself not judging people but trying to understand the mechanism behind their allegedly wrong or right behaviour. I am completely fine with the morality of the lead characters in Kieslowski's 'White' (1994). If my people, back home, can accept the culture and beliefs of the world that is inside and around me, they too will be fine with it. But most likely they will not. Ever. These two worlds will never understand each other. The characters from 'Vivah' will turn completely silent if they meet the characters from 'Three Colours: White'. The characters from the latter will possibly laugh at those from the first, but in their heart of hearts admire and envy them. And amidst these two conflicting worlds, marriage for me is and will remain a fascination, and a puzzle, that I will constantly try to figure out, whether I get married or not. It is a truth I can not close my eyes to. I will miss it if I don't experience it, and I will bear its pains if I do. As of now, I will leave it to destiny. 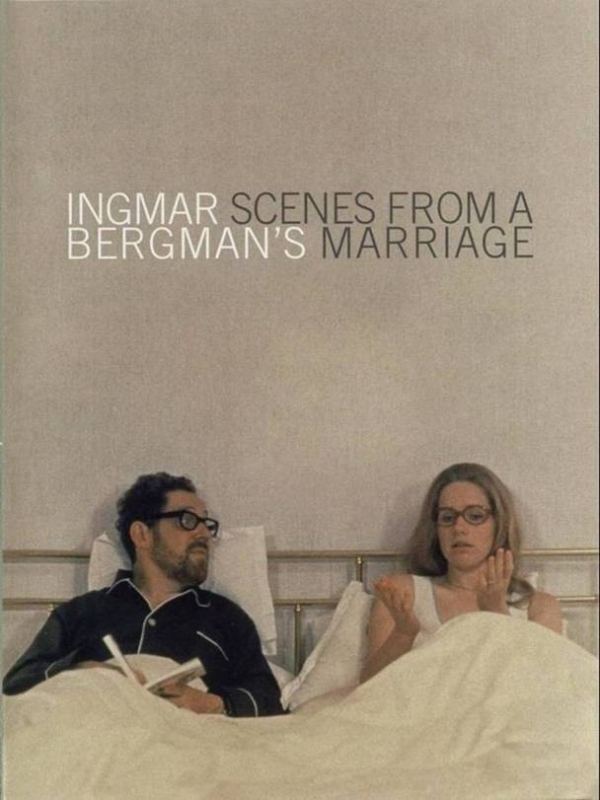 Ingmar Bergman's 'Scenes from a Marriage' (1973) will remind you of the films by Kieslowski. And it will remind you of the films by Gulzar. It will make you wonder how Sooraj Barjatya would react to it. Unlike any other Bergman film, a master film-maker whom I had always admired cerebrally for his surreal and philosophical dramas that never really tormented my heart or affected my soul, this film will make you think about your married life, whether you are married or not, and will remind you of all couples around you. Most importantly, it will make you cry miserably, deep within if not the actual act of weeping, and will connect you at an emotional level that you'd crave to go into the lives of the lead characters and help them out. But it will also make you believe that you can not. The man and the wife will have to do it themselves, amidst the magical bliss and the ugly pains that marriage brings with itself. Perhaps the only connection between the two realities is that the problems between the two should not leave the bed-room. Often, that is not the case. Hello Sir. I was eagerly waiting for the next Must watch but have a small doubt here. Not that I am not gonna watch it but on IMDB it show's this as a MINI - TV series with the time duration of 283 mins. Here are you talking about the whole series or a particular episode? The entire six-episode series was later edited together into a 160-minute film. I have watched that and not the entire TV series. It is very much considered as ONE film now, having won the Golden Globe Award for Best Foreign Language Film. Okay thanks :) Shall find it. Wow! What a read! :) And such a welcome far cry from the usual writing by our pseudo film critiques who are mostly content in mastering the art of summarising the story line of film in the frame of their column space. Thank you!